Everything Everything’s Jonathan Higgs on his songwriting pet peeve, their show post-Paris attacks, and the new LP Get to Heaven. ['Fortune 500'] is basically talking about breaking into Buckingham Palace and murdering the Queen. It’s the scariest song, I think. It’s difficult to write about Everything Everything’s kaleidoscopic music without being tempted to go into reckless adjectival overload to emphasize the Technicolor range of their vivid art rock. As with their previous works, Get to Heaven has all the charm of the band’s polyphonic-ringtone-inspired early songs, but with a heightened gravity as frontman Jonathan Higgs’ lyrics reach a new level of cryptic. The Manchester frontliners have cited the influence of 2014′s cavalcade of horror stories—ISIS beheadings, Elliot Rodger’s shooting spree—on their third album. The atomically mastered track “No Reptiles” is typically imposing. “I’m going to kill a stranger, so don’t you be a stranger,” broods Higgs. It’s typical of his delightfully clever wordplay that’s inventive without ever being jazz-hands zany and rueful without shrugging itself into a void of self-absorption. With Get to Heaven, Everything Everything has gradually reined in their initial bent to do, well, everything just because they can, gradually sanding down the clever-clever math rock of their quixotic kitchen sink debut Man Alive. From the snarling rage of “To the Blade” to the ecstatic bliss of “Warm Healer,” these pop explorers finally discovered their utopia. The four-piece harness their energy and admirable imagination to serve a song, as precision-engineered pop chops have displaced the willfully outré. They can now justifiably join the pantheon of a particularly British type of pop eccentric with Wild Beasts as their only equally able contemporaries, in which their music effortlessly teases the edges of both humor and emotion, flicking between the two without ever feeling contrived. Three albums into their career, there is a new swagger to EE’s stride. Frontman Higgs took part in the following in-depth conversation on behalf of his cohorts. 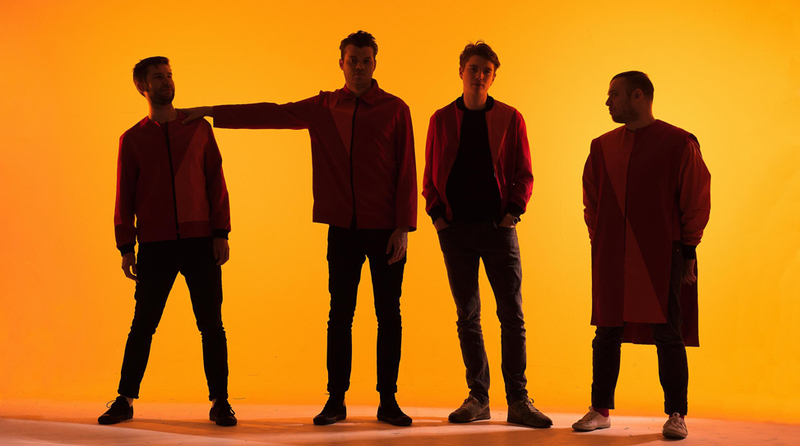 Everything Everything is set to release Get to Heaven in North America on February 26. Some time has passed since the release of Get to Heaven in the UK. Has the anxiety gone? Yeah, in some ways. It’s really nice that it came out and it’s been really, really great playing it at shows. It works really well live and we’ve had a really good reaction to it. It’s been a pleasure, basically, since we put it out. But I can’t wait to get over to America and see it all happen again, really. I love it when songs are new to people. I mean, a lot of our fans over there heard our stuff already, but it would be nice for it to be real and for us to get a proper release over there. Do you imagine the album will have a second life, so to speak? Exactly, and that’s the same with what we’re doing around it as well. We toured it in the UK and really gone around and drilled the record into folks here. It’s nice to go out there and do it again with new people. So yeah, it’s like a second life. We’re really relaxed in the way we play stuff now. We know what we’re doing, so all the early nerves are gone. You just have a good time. Did anything come as a surprise while touring the album for the first time? I’m always surprised when people sing-along, especially when we travel abroad and it’s not in their native language. They’re in fact not the most easy songs, and you have to stick your head around some of them as well. So that always surprises me. The best thing for me is watching people’s lips moving, watching the reactions to songs. The songs aren’t even big singles or anything like that, but they will still get a huge cheer because they know it and that just feels amazing. Sadly, I missed your performance at Strom in Munich last month because I had to fly out three days before the show. How did everything go over on that tour as a whole? Brilliantly! We really, really enjoyed that tour. We went out every night, met with fans and signed stuff. We kind of did it old school. It’s how we used to tour. It’s really nice in Europe because we’re not a huge band, but we still command quite a big crowd now. It’s really nice to watch very different people every night and meet them. It’s very different when we do it at home, honestly. Did you make a conscious choice to move far away from Arc with the new album? Are you just writing all the time, even on tour? You don’t keep that separate? Oh yeah. Last year, all of 2015, the album was out and I didn’t do much writing at all. Now it’s got to the new year and I’ve started again. I tend to write when we’re on tour, especially if I’m on tour with another band, which is what we’re doing over the next few months. You get lots of spare time because you obviously just do your warm-up set, you’re on the bus a lot, and hearing the other band every night always inspires you in one way or another. Do the lyrics set the tone for the songs, by and large? Is that the launchpad? Which track took shape first for whatever reason on Get to Heaven? I was gonna ask whether those first tracks sort of set the parameters for the entire album and the tone of subsequent songs, but then you also work on tracks that get tossed inevitably. Yeah, we did. Some of them end up on the extended version and things like that, but still, anything kind of mournful or quiet we just rejected straight out. I think we sort of didn’t think it was good enough because it was either too positive or too lot’s of things. [Laughs] With music, it’s one extreme or another, and we wanted a particular type of extreme this time. What can you tell me about “Fortune 500″? Choosing a favorite track off an album is definitely a cyclical thing, but I’m very taken by that at the moment. It came all at once and I wrote it quite quickly. I wanted the album to be based around some kind of horrific event, like terrorism of some description that we don’t even properly find, and you don’t know who the perpetrators are and you don’t know what side you’re supposed to be on. It’s this event that’s coming, and some of the songs have come after it and some of the songs before it. “Fortune 500″ is kind of during it. It’s got this horror soundtrack. It’s basically talking about breaking into Buckingham Palace and murdering the Queen. It’s almost like the centerpiece of the record. It’s everything leading up to the disaster, this event. You never know what it is, and it doesn’t really matter what it is. It’s the scariest song, I think, because it’s got these big waves of sound and you don’t really know what the hell’s going on. I’m singing it like I’ve been disconnected, brainwashed. It’s not like I’m an angry person and I think that’s kind of scarier. In what kind of headspace did you find yourself while putting down lyrics for this album? This record was a bit of a weird one. I got very obsessed with the rolling news and media, bad news from around the world during 2014. I got quite obsessed with people from our region who’d gone to Syria, got caught by ISIS and beheaded, and stuff like that. It made me feel quite terrorized in my own home. It felt like it was happening on my doorstep and it wasn’t just this thing on TV. I guess a lot of the fears and confusion and anger about it went into the writing, and I didn’t feel like people were really talking about it. Could you ever imagine yourself in that situation? Could you be the perpetrator or the good person? Do you ask what it takes to push people into these situations, rather than just be black-and-white about it? That’s not the most easy thing to talk about, especially in a pop song. It’s a position that no one really wants to take. There’s some confusion about my own headspace and I quite like that. I wanted to try and make people think about it. You guys played a show in Paris not long after the terrorist attacks. Just a week after, really. Was that quite an impassioned show, considering some of the things addressed on the album? That was obviously pretty intense. Not that many people came to the show. It was very, very quiet. There was this nervousness in the air. There was also security, as you can imagine. But they were really, really grateful we were there. You could see on their faces that they were happy that this could happen, that we could come out and stuff like that. So that made it very strong, especially considering some of our record is very direct in talking about quite nasty stuff sometimes. Some of that nasty stuff had just happened to the people they know in the city. It was so real. It’s not just fantasy at home in the bedroom talking crack. This really happened to these people. I hadn’t really had experiences with stuff like that with my lyrics before that’s not personal. It was pretty crazy. Does it ever come as a discomfort talking about your lyrics in such minute detail? Are you very precious about the words you put down and the writing process in general? “No Reptiles” is another phenomenal track. Is it very intuitive when you choose singles? Certain songs present themselves pretty early on. If you write a song that’s five minutes long with a good chorus, you know it could be viable for the radio. I used to hate having to think about that, but I kind of respect it now. I quite like the challenge of stopping the song and going, “Well, this could be a good single.” Before you even get to the studio, you think, if it’s about to be a single, let’s make the best single ever now instead of hurting ourselves about it later. So going into the record, we knew we had probably five or six songs that could potentially work on radio. “No Reptiles” was one of them? Do you imagine you’ll keep the same singles for the North American release? I really don’t know. I think “Distant Past,” certainly, but aside from that, I think we’ll let our American friends help us with that. When it comes to American radio, I don’t know a thing. What’s the dynamic like between you guys in the studio? Do you balance each other out? In a sense. Me and Alex are always writing, even before getting into the studio. When we’re in there, I tend not to play guitar because Alex is just better than me. Jeremy will plays keys and things like that. We kind of know what we’re good at, even if it’s not our primary instrument. I can rely on Alex and ask, “Can you go write me a spiky solo over this bit?” All the guys ask me if I can write a vocal to go over “this.” That’s part of learning to being in a band: You know when someone’s slacking. You know when someone’s blanking. [Laughs] Expectations can make things run real smoothly. We do have a formula of sorts, but we don’t like to repeat ourselves if we can. Did you experiment with some new gear on this particular outing? Yeah, we did. Alex has been slowly building his own synth from the ground-up. He gets a new component every six months or so, wires it in and fiddles with it. That was good fun to play with and that’s always growing. When we come back to it for the next record, it should be a masterpiece. Obviously, we had a great dance producer, Stuart Price, and he had all these laptop-based stuff we’d never even really encountered before because we’re not in that game at all. You guys didn’t incorporate synth when you first started out, did you? No, we didn’t. We had two guitars, bass and drums. That was it and our voices. We steadily grew from there. It was kind of intentional because I always wanted to start a simple band and then make it more complex as time went on, trying to stop running before we could walk. You guys formed in 2006? Does it feel like that much time has passed? There was this period before we even started, too. I don’t know. It does and it doesn’t. The songs sometimes feel old as hell. Sometimes they feel like, “Ah! I got that now!” Sometimes I think, “God! What the hell was I thinking? ?” [Laughs] Ask me again in 10 years and it will probably feel as if only a few years have passed. Right now, it doesn’t feel like any time has passed because we kind of never stopped and there aren’t big landmark moments. You don’t really feel getting bigger or having a bigger fanbase or anything like that. It’s so gradual. It kind of sneaks up on you. What’s the first piece of music you ever purchased for yourself? For myself, it was Bat Out of Hell II: Back into Hell by Meat Loaf on cassette. It was surprisingly good, actually. Thinking about it now, it was not bad! I have no idea why I bought it. I guess I thought it was a rebellious thing to own that at 7 years old or something. So there you go. I used to buy music based on the artwork. Of course. My girlfriend still does that. [Laughs] She downloads singles on iTunes based on the artwork. She’s got an incredibly diverse library, which is quite cool actually, especially when you start using Genius Shuffle where it finds things related to you, and down the rabbit hole you go. You’re just panning for gold at that point. Yeah, exactly. If it’s a ridiculous image, the music will be similarly ridiculous.